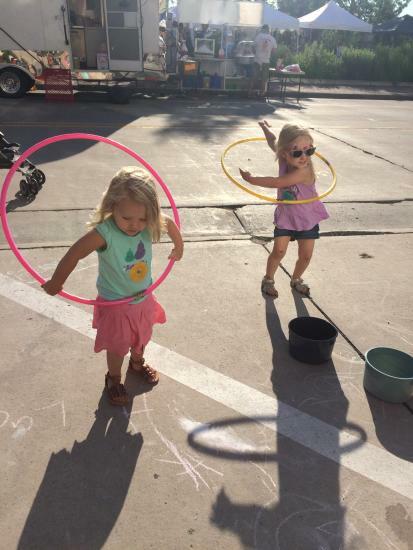 The Inaugural Family Day in downtown Phoenix Park was an event filled with fun, memorable things for all ages. The car ride home was filled with excited chatter, sun kissed tans and a collection of memorabilia from the day’s adventures. And if your children were anything like mine, they talked about the things that stood out to them for days afterward. It’s days like those that you are so thankful for the family friendly community that we have in Eau Claire. But we don’t have to let the fun stop there! If you loved the outdoor movie on the giant screen then be sure to check out…. The Stardust drive-in theater in Chetek is about 40 miles from here but is a fun option for an outdoor movie viewing. However, if you aren’t up for the drive, UW Eau Claire has a free movie showing every Wednesday night in the summer time in the Haas yard. Come early to enjoy music, activities and yard games! I mean for real, who doesn’t want to play on a Jumbo Jenga, Giant Connect 4, Ginormous Croquet, Super Disc Slam, Jumbo Checkers, Oversized Kerplunk or Twister! There is also free popcorn and beverages available as well as some local food truck vendors. Sounds to me like a great way to create family memories! Irvine Park, a donation based organization, has a little bit of everything for the family! Along with great playground equipment and a fun splash pad for hot summer days, they also have a zoo filled with many unique animals. 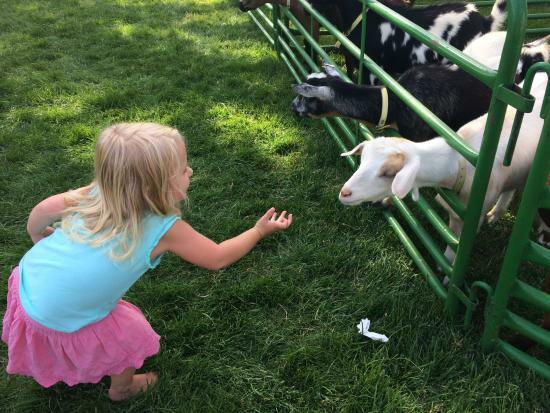 The Red Barn Petting Zoo area is filled with bunnies, pigs and goats that the kids can have hands on contact with. There is really so much to see and do at Irvine Park, I highly recommend packing some food and making a day of it! Govins in Menomonie has a whole bunch of baby animals each spring that you can hold and touch! Their motto is “if it fits in your lap, we will help you hold it!” They have pony rides outside and face painting just like Family Day! Another great place to visit is Schultz Barn in Eleva which has goats (both pygmy and fainting), roosters, chickens and a miniature horse. It is free to visit the animals and if you go on a Tuesday in the summer you will get to experience their live music event. Keep reading for more on that! On Tuesdays, Owen Park in Eau Claire is filled with Blues Music. Local food vendors gather and people bring their blankets, chairs and beverages to relax and listen to the music. Schultz Barn in Eleva has a featured band every Tuesday in the summer too. It is just gorgeous! It isn’t too crowded and it’s set in a barn looking out over the rolling fields! They have a wood-fired pizza company come and they also sell ice cream. You can bring your own beverages and just relax with family and friends in a smaller more intimate setting. Thursday, Pheonix Park in Eau Claire has their Sounds Like Summer Concert Series. 2,000+ people come to this awesome event every Thursday night! If you haven’t checked it out, you must! Listen to great music, taste food from local vendors and enjoy the community vibe that is ever present. Beaver Creek Reserve is another great nature adventure hub just outside of Eau Claire! Spend the afternoon exploring their 9 miles of trails through their diverse landscape. When the snow flies you can rent snowshoes or skis to traverse these winding trails. While outside be sure to stop and check out their Nature Nooks with three nature play pods (Fantasy Forrest, Symphony of Sounds and Little Kid, Big World) for kids to explore. Or check out their new Scheels Discovery Room with interactive, hands on learning activities and exhibits. This summer make sure to stop into their Butterfly House! It is open from 11-3 PM Monday-Saturday and 12-3 PM Sunday! As they say, “It is fluttering with native Wisconsin butterflies!” For an evening outing, check out the Hobbs Observatory for stargazing and astronomical facts! I urge you to check out their website for many more unique programs and summer camps! Action City’s Trampoline Park sets us all up for a successful rest time! Let the kids jump out all their wiggles in a place where they can literally bounce off the walls! Toddler jump time is on Tuesday and Wednesday where you can get an hour of jumping for kids five years old and under for just $5! But of course, there is no age limit to the trampoline park! 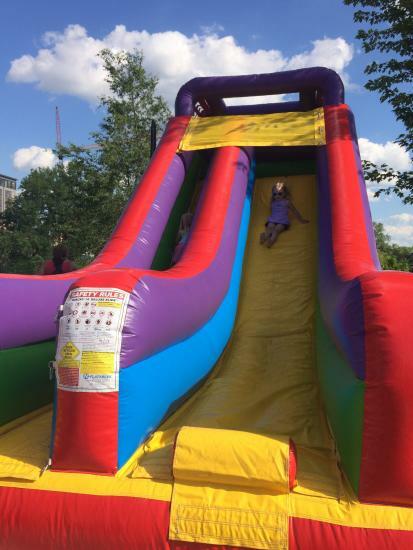 Older kids will love to challenge you to a round of dodge ball or race across the Ninja Warrior course! High Roller’s isn’t just all about traveling back in time to the roller rink! It also has a climbing play area much like McDonald only BIGGER! This is another great option for an active indoor experience! High Five Free Yoga at Phoenix Park in the grassy area across from the RCU building is a fun way to get people of all ages to get up and get active together. They are wonderful about working at all yoga skill levels so that everyone can feel comfortable. Bring your mat and join a community of fun loving yogis! 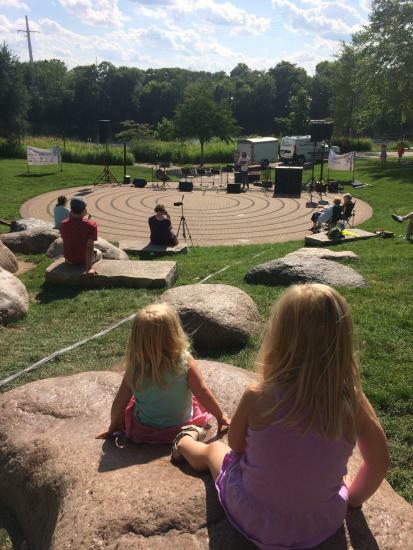 Kid’s Yoga in the Park is a free event that happens every Tuesday in Carson Park! Bring a towel or yoga mat and let your child strengthen and gain awareness of their body through poses, stories and games! Our area is full of different bike/walking trails and paths to explore. Take an adventure hike down the Chippewa River Water Trail or hike through Lowe’s Creek! See where the path leads you! Or if you are brave, trying forging your own trail! Try out some amazing parks! You must make time to explore some of these hidden gems! Have you checked out the new park on Jeffer’s Road or how about Rod and Gun Park?! They have some pretty unique play equipment. Each show raises money for different community group! The L.E. Philips Memorial Public Library! 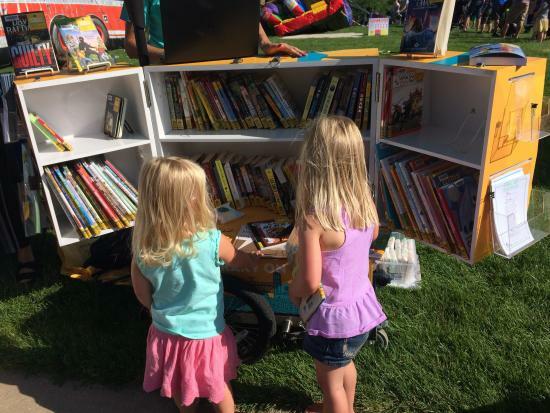 They have a fun summer reading program going on until August 15th! Sign your children up to read a book or be read one by a volunteer. They can also complete various activities to earn fun prizes. Story time for kids happens every morning at 10:15 until July 28th. This is a fun place for young ones to hear stories and song as they interact with peers. For teens, they have Dabble Box Open Labs every Tuesday from 4-6 p.m. where you can explore and create in a hands-on environment! There is a wide range of things to take interest in here, from 3D printing and coding to arts and knitting. Another hidden gem is their themed coolers that you can check out. Each cooler is packed with books, games, DVDs, puzzles and many other interactive things that fit with the theme. Don’t forget about the PBS Kids Get Up and Go! Day on August 5th from 10 a.m. till noon at the lower level of the library. This is a free event jam packed with fun physical movement and hands-on activities for all ages. Let’s go make more memories! We are a playful city for a reason!